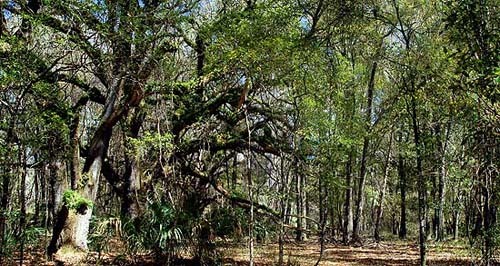 Paynes Praire Preserve State Park is located south of Gainesville and just north of Micanopy on US 441. This park became Florida´s first state preserve in 1971 and is now designated as a National Natural Landmark. 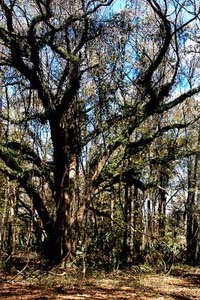 Noted artist and naturalist William Bartram called it the great Alachua Savannah when he wrote about his visit to the prairie in 1774. A biologically diverse area, there are more than 20 distinct biological communities providing a rich array of habitats for wildlife which include alligators, bison, wild horses and hundreds of species of birds. There is a visitor's center that includes exhibits and information on the area´s natural and cultural history. In addition, there is a 50-foot-high observation tower that provides visitors with a panoramic view of the preserve. There are numerous trails throughout the preserve including the Chacala Pond Trail (6.5 miles), Jackson's Gap Trail (1.2 miles), Cone's Dike Trail (8.4 miles), Wacahoota Trail (0.3 miles), and the Lake Trail (with views of Lake Wauberg). Pine Road is a grassy service road which is raised above the surrounding landscape and tends to stay drier. The paved rails-to-trails Gainesville-Hawthorne Trail is located along the north side of the prairie and is accessible via an entrance off of SE 15th in Gainesville. Be aware that these trails will become flooded during times of heavy rainfall. If you are interested in running these trails, please contact the park's office to check on the status of the hiking/running trails. Also, if visiting during the hot humid summer months, be sure to carry hydration, sunblock, and insect repellant as these trails are muggy and open to the sun as you jog through the pineland habitats. 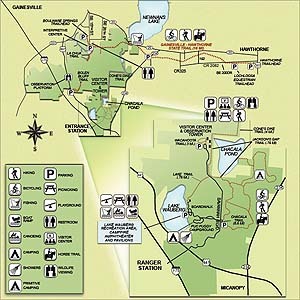 The numerous trails make it possible to run a long distance on trails only or with connections between trails via the paved main park roadway. The stunning landscape and views makes this park a great place to get a good run in and enjoy the day! You can also jump into Lake Wauberg for a cool treat after a hot and humid run. Coming from the north on I-75: Take exit 374, the Micanopy exit, and turn left at the end of the exit ramp. You will then be traveling east on CR 234. Stay on this road 1.4 miles until it intersects with US 441. Turn left onto 441 and go 0.6 miles to Paynes Prairie Preserve State Park (on the right). Coming from the south on I-75: Take exit 374, the Micanopy exit, and turn right at the end of the exit ramp. You will then be traveling east on CR 234. Stay on this road 1.4 miles until it intersects with US 441. Turn left onto 441 and go about 0.6 miles to Paynes Prairie Preserve State Park (on the right). There is a charge to enter the park via the park office on US 441 - please visit the Prairie Preserve State Park web site for more information. For more information, visit the Friends of Paynes Prairie.